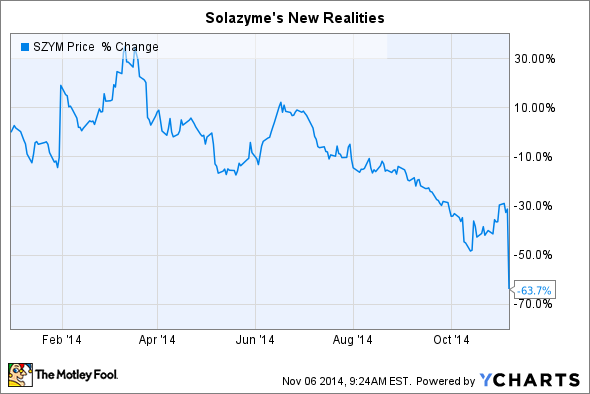 Read this before selling or buying Solazyme shares on the massive post-earnings dip today. A few weeks ago I wrote an article detailing the 12-month-long sequence of events that indicated renewable oil manufacturer Solazyme (NASDAQ:TVIA) was having larger than expected (and disclosed) problems with its manufacturing facility in Moema, Brazil. At the end of the article I suggested management use the third-quarter earnings conference call as an opportunity to begin rebuilding investor trust by being honest about the seemingly obvious issues. Platform problems wouldn't necessarily spell disaster for the company as a whole, depending on their severity, but promises for high sales volumes and gross margin in the near term didn't quite match up with realities on the ground, such as a lack of market development and absence of the reliable track record needed to reel in customers. Well, management seized the opportunity, but there won't be much celebrating after investors digest and interpret the sobering admissions made during the call. There's plenty to cover to explain today's drop (and the declines to follow), so let's dig in. The real news has nothing to do with the quarterly results, but rather in the major pivots Solazyme made in its commercialization strategy and expectations. You can check the press release for quarterly financial numbers, which are discussed in context below. Although I must admit the company's cosmetic brand, Algenist, removed my doubts for hitting targets by growing sales 41% in the quarter compared to the year-ago period. Why the new commercialization strategy? Solazyme drastically changed its overall commercialization strategy to focus on high-value, high-margin specialty products that will stem the massive losses and buy time for a meaningful revenue boost. Why? The company's previous strategy was mired in a positive feedback loop that gushed with red ink. Solazyme needed large offtake agreements to fulfill production capacity and drive production costs down, but customers needed to see production capacity filled (i.e., reliability) before committing to large offtake agreements. It doesn't help that the company greatly mistimed the need to develop multiple, unrelated markets with its premature leap in production capacity. If there are no buyers for your products -- no matter how great they perform -- then there's no value to your production capacity. Of course, there seem to be larger technological issues, discussed below, that are also keeping the company from hitting its expected production costs. While the transition to produce higher-value products will help somewhat in the meantime, investors must realize that neither the Moema facility nor the company's production plant in Clinton, Iowa, are designed to run profitably at the low capacities planned for 2015 with the higher-value products accessible by the platform. Consider that certain products are only high value because they have niche uses and smaller markets, which means the company will also be slashing production volumes for the foreseeable future. Investors should no longer expect Moema or Clinton to reach nameplate capacity in 12-18 months after start-up. Instead, the dates have been moved back indefinitely for when market conditions allow (offtake agreements and market development). Focus production on commodity replacements for existing markets (drop-ins). Focus production on high value niche products and selected commodity replacements. Drastically reduced production volumes, revenue realization, and profitability pathways. Maximize production volumes to drive costs down while creating demand for products and expansion. Maximize returns on capacity investments. Solazyme won't be profitable anytime soon, so it will fill a modest amount of its existing capacity to stem losses and buy time for market development. Attract customers from broad industries with broad needs. Focus on anchor customers, distributors, and select high value opportunities. Find a handful of customers willing to take the risk on the platform in the near term to attract bigger offtake agreements with various customers in the future. Source: Solazyme 3Q 2014 presentation. The inability to ramp to and utilize all 120,000 metric tons of annual nameplate capacity is pretty bad news for Solazyme investors in the next few years. The company no longer expects to consolidate assets, liabilities, and revenue from Moema in 2015 -- a move that could have boosted total noncurrent assets by more than $200 million. That also means greatly muted revenue growth for 2015 and likely beyond. Excluding revenue from Moema, management expects total sales to grow by at least 15% next year, or to just $70 million. That's well below Wall Street's recent consensus of $335.6 million (although that number was unrealistic in even in a best-case scenario). Worse yet, guidance for just $70 million in revenue for 2015 is telling of management's overall expectations for production from Clinton. Consider what it means when accounting for Solazyme's Algenist cosmetic brand and research and development revenue. *Author's assumption, on pace for >$24 million. **Assumes 20% year-over-year growth from 2014 target of $26 million. Source: Solazyme quarterly presentations. The table above suggests that Clinton will produce just 6,400 metric tons of renewable oils in 2015 if the average selling price is $2,500 per metric tons. That's a run rate representing one-third of nameplate capacity 24 months after start-up. In addition to the numbers made calculable in the table immediately above, management provided some clues to production achievements at Clinton. In 2014 the facility has realized 45 successful fermentation runs in tanks that are roughly 500,000 liters in volume. We can actually use that to estimate the volume of renewable oils recovered from a typical production batch, although results vary based on the renewable oil profile being produced. From company updates, we know that Solazyme has produced at least 2,500 MT of renewable oils at Clinton through the first nine months of 2014 (at least 500 MT in 1Q14 and at least 2,000 MT total in the two quarters since). We can assume that the average density of the company's renewable oil products (myristic, lauric, palmitic, capric, oleic) is about 0.9 kilograms per liter. Simply plug the known numbers into the right side of the equation to determine the volume of renewable oils recovered for each batch. We find that Solazyme recovers roughly 60,000 liters to 70,000 liters of renewable oil in every batch at Clinton. Now, "recovers" means after all downstream processing is completed. It's also important to remember that although the tanks have a total volume of 500,000 liters, the maximum volume possible is significantly lower after accounting for working volume and total theoretical yields. Either way, there is plenty of work left to be done to improve the recoverable amounts of renewable oils. Moema is cleared to utilize three unique production strains. Successful fermentation runs have been conducted in all five 625,000-liter tanks. The facility is designed to operate four batches simultaneously (the other tank gets cleaned and loaded). Moema is not expected to be consolidated in 2015, which means management isn't expecting production levels to soar. Noting the capabilities of Moema is one thing, but demonstrating results is another -- and I remain skeptical that fermentation issues aren't plaguing production. Although it was not available at the time of this writing, investors can use an investigative trick to gauge the real-world production of the facility. How? In 2011 Solazyme signed an agreement with feedstock supplier and joint venture partner Bunge, which granted its partner the option to purchase 1 million shares of common stock that vested in three separate installments for hitting three separate milestones. The first milestone occurred when the agreement was signed and unlocked 25% of the shares. The second milestone occurred when construction began at Moema and unlocked 50% of the shares. The third milestone will occur when total aggregate output of renewable oils reaches 1,000 MT and unlocks the remaining 25% of shares. While 1,000 MT is an incredibly low volume for a facility that should be producing over 8,300 MT of products every month at full capacity, Solazyme stated in its SEC filing for 2Q14 that only 750,000 shares (75%) in the agreement had vested as of the end of that quarter. Investors can read through the 10-Q for the most recent quarter when it is submitted to the SEC to learn if the remaining 25% of shares vested, which would also tell if total all-time production at Moema has crossed the 1,000 MT level. If it hasn't, then I would assume something has gone wrong with the fermentation process, especially considering that (1) the facility began operations at the end of May 2014, and (2) only about 13 fermentation runs are needed to produce 1,000 MT. Let's not sugarcoat recent events: Solazyme's prospects just took a pretty big hit. While management is making the correct move by going all-in on higher-value, higher-margin products, the company will have a massive amount of unfilled capacity weighing on the economics of its overall platform in 2015. Given management's admissions and the challenges I've heard from various other industrial biotech companies, I cannot be sure that Solazyme will reach the targeted production costs that will enable profitable (or closer to breakeven) production anytime soon. Despite what management has said, investors should have concerns about the fermentation processes occurring at Clinton and Moema. The problem is that it's difficult to parse out how much of the lackluster capacity fulfillment is due to undeveloped markets and how much is due to technical hurdles. Solazyme will end the year with $200 million in cash, which will put some distance between investors and the next capital raise, but the day will come when the company must go back to the well -- and the terms will not be nearly as favorable as past raises. I would feel very uncomfortable buying Solazyme shares until the company can demonstrate or disclose more information that removes any doubt that fermentation processes, the core technology, are potentially the/a culprit for the swift change in commercialization strategy. If you already own shares, then you have a much more difficult decision. You could hang on for the ride and hope Solazyme jumps back on track by the end of the decade or sell your position to offset gains from elsewhere in your portfolio with the losses. You might be tempted to add more shares at lowly numbers -- and that might not be a bad idea in the long run considering the market cap is headed to $300 million -- but be sure that you throw all prior expectations for market valuations, share prices, revenue growth, and earnings out the window.